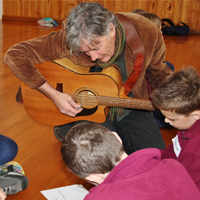 WEPS has a rich extra curricular music program, which caters for absolute beginners to the more advanced young musician. For our inspired young beginners, we run Music Academy one lunch time per week. In this session, experienced students from School Band assist Miss Kavanagh in tutoring students in instruments of their choosing with no commitment or prior experience needed. When a place for School Band becomes available, a new regular attendee of Academy would be selected by the band to fill the position. Music Academy has seen students build skills in various instruments, timing, team work and social skills. For our more experienced young musicians from grades 3 to 6, we hold a School Band rehearsal once per week. School Band is made up of pianists, percussionists, guitarists and vocalists. The School Band chooses their own set list and work on these songs in preparation for whole school performances. This gives students the opportunity to refine their instrumental skills in a group setting, preparing them for future band skills while developing social skills and friendship. Finally, we have School Choir. Choir is held once per week, where students from all year levels are welcome for our warm up and grades 3-6 rehearse a set of songs, which they perform to students and parents walk into assembly each week and then lead the school in singing the national anthem.